Put away the rose-tinted spectacles; is Sauber the new Benetton? Most team principals will tell you that there's no magic to the F1 business. Things don't just change overnight and even if you work all the hours God made, if you don't have the correct application of technology, then you're wasting your time. To which I would add, from very long experience, the obvious answer to unpredictable conundrums after often staring you straight in the face. But you have to avoid that classic F1 affliction of trying to make things more complicated than they really are. I had started out this column determined that I was going to upset a lot of people. It was my original contention that the Sauber Petronas team hasn't suddenly discovered the magic elixir of F1 success. The reason they're apparently doing so well - fourth in the Constructors' Championship at the present time - is that Jordan, Benetton, BAR and Jaguar have generally been so dismal in 2001 that the points those teams should have scored have instead gone to the Alpine brigade. In fact, closer examination undersells Mr. Peter Sauber's team. The reality is that they've taken over the role of Benetton as best-of-the-rest after the three mega-teams. OK, Sauber have a very good car and probably the best driver line-up they've ever enjoyed in the form of Nick Heidfeld and Kimi Raikkonen. They've also got last year's World Championship winning V10 in the back of the C20. But I still content that they have not suddenly become miracle men after eight largely barren seasons as bit part players on the F1 scene. Interestingly, precious little has changed since 12 months ago, apart from the fact that Sauber has been on the up and Benetton - until the Spa turnaround - very definitely on the down. In fact, with three races to go, the Constructors' Championship points table amongst the second division runners is almost exactly(italics) the same as it was 12 months ago. 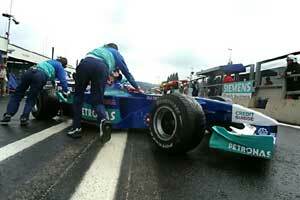 Benetton had 20 points with three races to go last season, this year Sauber has 20 points with three races to go. BAR and Jordan are currently tied on 16 points; 12 months ago they were tied on 13 points. Jaguar is currently eighth on five points; twelve months ago it was ninth on three points. What does it all mean? Only that Sauber has improved, but by quite how much can't accurately be quantified. Jordan, BAR and Honda - Honda in particular, it should be noted - are not really making any worthwhile progress at all. Ditto Jaguar at the moment. The reality is that, in the wake of the mega-teams, not much changes in the F1 business. Nor, on the basis of the above statistics, is it likely to in the foreseeable future.